Every day, many patients across the U.S. face access challenges to medications or treatments they have been prescribed because they do not have insurance, their insurance does not cover the prescribed product or treatment, or they struggle to navigate the complex insurance process. To address these and other obstacles, Sanofi supports many of these patients with their specific challenges. Sanofi Patient Connection™ is a signature North America Corporate Social Responsibility initiative focused on improving patient access to 23 products and treatments across Diabetes and Cardiovascular Diseases, General Medicines, Oncology and Vaccines. Five years after the program’s launch, more than one million U.S. patient applications have been received and processed. Patient Assistance Connection: Made possible by the Sanofi Foundation for North America, this program provides medication free of charge to patients who have no medication insurance coverage or who do not have access to the medication through their insurance and are considered to be functionally uninsured. Resource Connection: A program counselor helps identify local or regional resources in a patient’s home area that might be able to help meet his or her needs, such as clinical support services, free or discounted transportation, nutritional supplement or meal programs, patient advocacy, home care services, etc. “What truly makes Sanofi Patient Connection unique is both its holistic approach to the access challenges many patients face, as well as the level of integration achieved across therapeutic areas,” says Peter Lalli, Interim Head of NA Corporate Social Responsibility. In 2016, for example, approximately 27% of the patients the program assisted were prescribed more than one Sanofi product. These patients were able to apply for assistance using a single application, with the same set of eligibility criteria. “Beyond the level of integration across the brands supported, the most significant differentiator for the program is the level of support given to patients to assist them in transitioning to healthcare insurance – whether Medicaid, Medicare or the Health Insurance Exchanges,” added Peter. In 2016 alone, more than 15,000 patients were educated on their options and assisted in their transition to insurance. 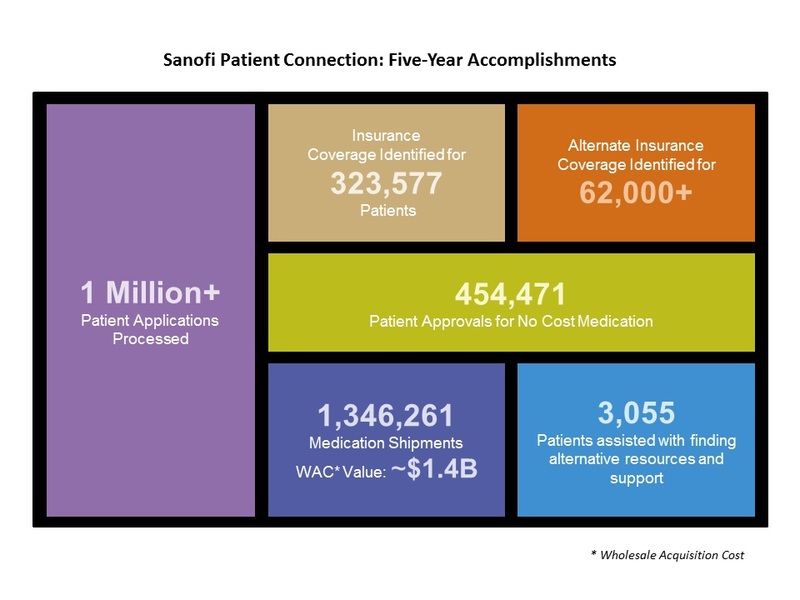 Not only did they gain access to the product(s) they were prescribed, but they also now have broader healthcare coverage that they did not have before receiving assistance from the Sanofi Patient Connection program.